This fine British anthology series, features plays based on the best of literature, films and English theater. 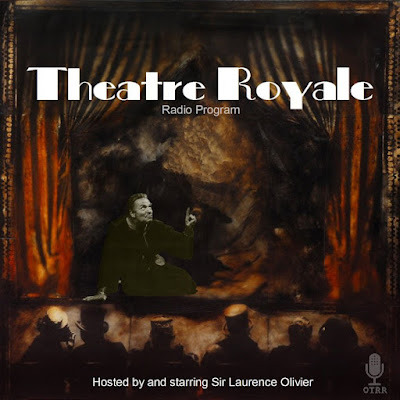 Produced in two series, Sir Lawrence Olivier and Sir Ralph Richardson serve as hosts, narrators and many times portray the leading roles. The program apparently was developed as a vehicle to capitalize on Olivier’s name and talent. His career spanned over 50 years and continues into the 21st century, as in 2004, 15 years after his death, he was starring as Dr. Totenkopf in a Hollywood fantasy film titled, Sky Captain and The World of Tomorrow. This was accomplished by the producers who selected footage of Lord Olivier from various films and used to create a villainous leader of killer robots in the film. Jude Law, who stars in the film, said film-makers used Olivier because few other actors possessed his authority. Sir Ralph Richardson from 1954 – 1955 played the character of Dr. John Watson in another Harry Alan Towers radio series of Sherlock Holmes stories, which starred Sir John Gielgud as the famous consulting detective. Many fine actors of the British stage and screen were involved in individual episodes of the Theatre Royal series, such as Sir John Gielgud, Robert Morley, Harry Andrews, Muriel Forbes, Robert Donat, and Daphne Maddox. The music was credited to the renown British organist and arranger, Sidney Torch. However much of the same music was also used in other Harry Alan Towers productions on which Torch also worked, such as The Secrets of Scotland Yard, The Black Museum, and The Many Lives of Harry Lime. So how much of it was actually written for this series will probably never be known. Harry Alan Towers produced and directed the show for his Towers of London company for international syndication, at the time in Europe, South Africa and Australia. The episodes included in this distribution are from the initial US run on NBC. However selected episodes were repeated, with a different series opening and close on the ABC Mystery Time series during the late 1950s. The show Theatre Royal remained in active syndication in the United States well up into the 1970s. Many of the copies in circulation today, come from those 1970s repeats where the individual episodes were cut to about 20 minutes. Luckily these cuts were made by the production company and generally do not take away from the actual program enjoyment. This reduced length comes from a combination for factors including removing dated introductory material from the beginning of the early episodes, making time for local stations to include hourly 5 minute newscasts and to insert commercials locally. In conclusion, this series consisted of new radio adaptations of famous, and not so famous stories by some of the best authors in the United States and England. It is the inclusion of some of those little known masterpieces by many familiar authors that gives the series a variety element usually missing in this type of anthology series. Its long syndication run, well into the 70s, proves once again classic stories presented by talented actors never really goes out of style.